These new Project One ICON paint schemes are IMMENSE! above: Barry grabbed this shot of the "Refliptive" paint scheme shimmering in the sun - this is gonna be big! 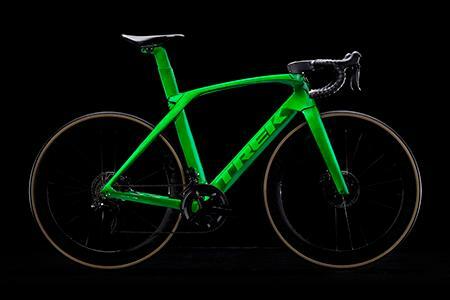 It's no secret, we're big fans of Trek's Project One scheme, and we sell a lot of these awesome custom bikes. So a fresh range of custom colour schemes is something we had to check out, and Barry has been admiring them in person. 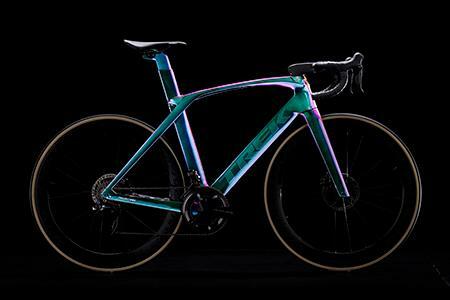 Project One allows you to customise your new Trek to your exact specifications, everything from wheelset and gruppo to the colour of the bar tape. And of course we include a full Bespoke bike fit, so not just the frame but all the contact points will be the perfect size for you. 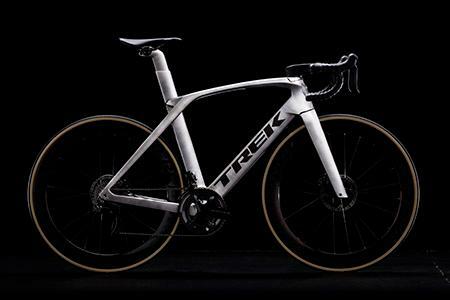 All the benefits of Trek's massive R&D budget, tech expertise and purchasing power, with the unique qualities of a custom build. ICON is available to order now from Bespoke Cycling - give us a shout! Those of us who remember the classic Klein colour schemes of times past will feel a particular twinge of nostalgia, and excitement, at the sight of this one. Updated to take advantage of new paint technologies, this has a depth and lustre that set it apart. I think this might well prove to be the most popular of all - it looks good in the studio shots, but really comes to life in the sunlight. Shades of amethyst and bright green flip to purple in changing light. 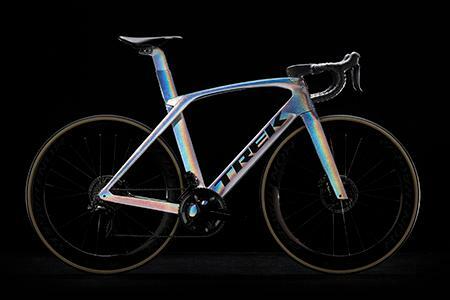 There's reflective technology in the Trek logo, too. An understated paint scheme from a distance, look closer and it is startlingly unique. This lustrous metallic finish has a depth and gloss that really shines. Up close, the Black Gold paint scheme is as classy as a tuxedo. From a distance, the metallic flake and the raised dimensional logos give it a unique presence and an eye-catching depth. A high-gloss finish, double green tint and dual candy green tonal logos that seem to stand out from the frame. This is a wet-look masterpiece of a paint scheme, guaranteed to lift your spirits whenever you get on the bike. Probably the hardest of the ICON paint schemes to capture in a still photo. It morphs in changing light to show every colour and shade in the rainbow. Check out the video towards the top of this page to see it "in motion", it really is something. 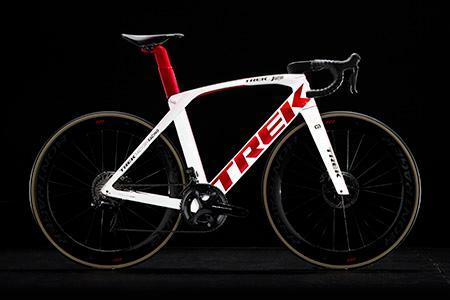 Chrome Tour is the ICON scheme that you'll see Trek-Segafredo's Tour de France professional race team riding. Its multi-dimensional pearl white base colour is complemented with oversized chrome red and black team logos. Project One ICON is a collection of premium, bespoke paint schemes that represent the highest level of artistry in custom bicycles. These designs are more than colours that stand out; they're filled with texture, depth, and mood. Each ICON paint scheme showcases a mastery of brush and paint, reflecting the passion that the most experienced Project One artists bring to their craft. 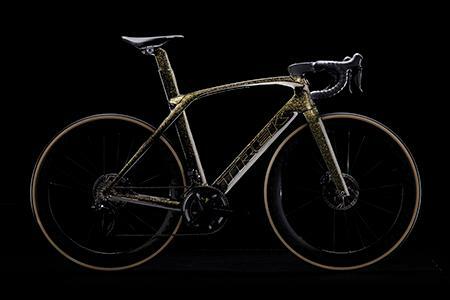 In addition to Project One ICON, there are all-new Select, Premium, and Signature schemes, with new colours, also available for the Madone SLR. Get in touch and better still, come and see us, and we can talk you through the many and varied options. ICON itself is available exclusively on the all-new Madone SLR platform. Read more about the new Madone here.